Ohio Democratic Party Chairman David Pepper wants to know why DeWine hasn’t been said whether he supports Ohio’s Medicaid expansion. 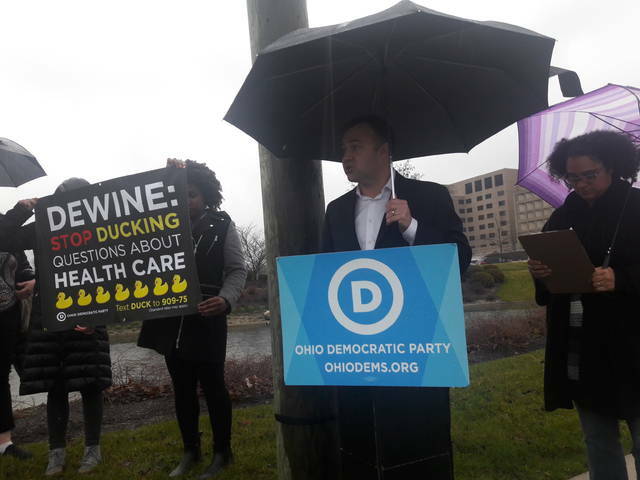 LIMA — A small group of Democrats — seven in total — stood in the rain outside of Mercy Health-St. Rita’s Medical Center Tuesday afternoon to demand that gubernatorial candidate Mike DeWine make his stance known on whether he will keep Ohio’s Medicaid expansion on the books. DeWine’s Republican primary contender, Lt. Gov. Mary Taylor, has already said that she disagrees with Ohio’s Medicaid expansion put into place by current Gov. John Kasich, and she has said that she would get rid of the program if elected. Carla Thompson, Lima’s 3rd Ward councilor, also took time Tuesday to make her opinions known on the issue during the small rally. “I think one of the things we need to do here in our area is demand accountability from the people who are in office and the people who are running for office,” she said. DeWine’s position has been lacking detail, but he has made it known that he does not support ObamaCare. Throughout the campaign, he has said he would like Congress to allow states to create their own customized Medicaid programs, which would be paid for by block grants and waivers. He has not been explicit on whether he would cancel Ohio’s Medicaid expansion. Almost one in five adults are enrolled in Medicaid in Allen County. “There are Republicans who would say if you’re not supporting Medicaid expansion, you’re not serious about dealing with the opioid crisis,” Pepper said. “The party had contacted me and wanted to know if I was concerned about the issue, and I definitely was. My main concern was the focus on getting those people who need mental healthcare, make sure they stayed covered. I don’t see how you combat things like the drug crisis without helping people before they ever get there,” Thompson said. https://www.limaohio.com/wp-content/uploads/sites/54/2018/04/web1_20180403_132306.jpgOhio Democratic Party Chairman David Pepper wants to know why DeWine hasn’t been said whether he supports Ohio’s Medicaid expansion.